Happy Halloween! It has been unseasonably warm this month in Santa Fe, and in the absence of cuddly sweaters and hot seasonal drinks I'm struggling to feel completely absorbed in the fall season, but the evenings are starting to get chilly and there is definitely a crispness to the air. I'm down to (probably) my last full week at work before Baby makes her debut! Tonight we're staying in and cheering on the Vikings while handing out candy to the neighborhood Trick-or-Treaters. 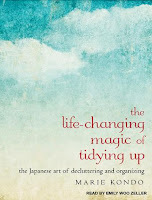 I recently hopped aboard the "tidying up" bandwagon based on Marie Kondo's book, The Life-Changing Magic of Tidying Up: The Japanese Art of Decluttering and Organizing. The basic premise of Kondo's philosophy on tidying and organizing is that the typical "tidying up" that people do, little by little, one room at a time, doesn't create lasting effects, so we instead need to make a substantial, transformative change in our space by focusing on the objects that bring us joy and parting with clutter that isn't necessary. Kondo challenges us to recognize our attachments to things and to "detox" our space in order to "detox" our bodies. October is my favorite month in Santa Fe! The Aspen leaves are changing and the air is so fresh. Unfortunately I have been fighting a cold (or maybe allergies) since Labor Day, and the Chamisa and Ragweed in the air certainly aren't helping, but I love being outside in the fall. I took Kua for a short hike on the Aspen Vista trail last weekend to see the fall colors, and I look forward to some more hiking later this month. There's such a small window between the end of the summer and the first frost and I just want to enjoy every minute of it. Fall is also rich with yummy flavors and it just puts me in the mood for baking pastries, cooking soups, and enjoying comfort food. I made some St. Louis Gooey Butter Cake for a birthday party this past weekend, and these Apple Cinnamon Muffins from my favorite blogger were also a huge hit! The cinnamon crumbles on top remind me of the Cinnamon Crunch bagels at Panera... yum! We are less than 5 weeks away from Baby's due date! She's estimated to be over 5 pounds already and the size of a spaghetti squash. She's moving her arms and legs all the time and she gets the hiccups almost every day. I had two beautiful baby showers during the month of September and I feel so supported by all my friends and family who already love little Baby Girl.